蔡子颖, 张敏, 韩素芹, 等, 2018. 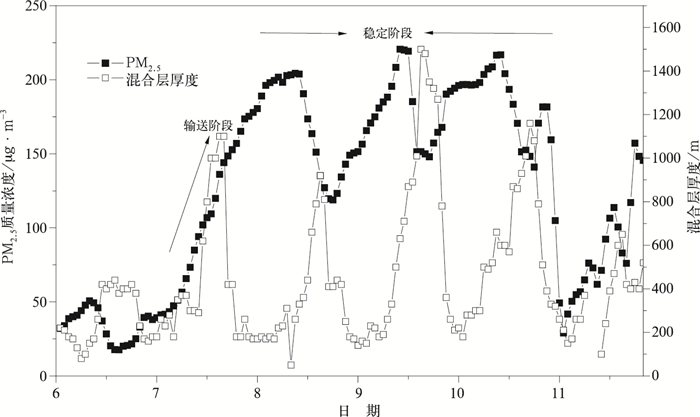 天津重污染天气混合层厚度阈值及应用研究[J]. 气象, 44(7): 911-920. DOI: 10.7519/j.issn.1000-0526.2018.07.006. CAI Ziying, Zhang Min, HAN Suqin, et al, 2018. 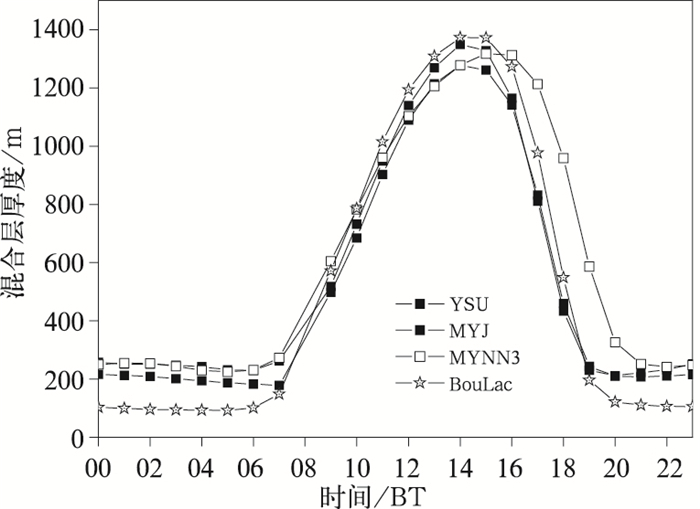 Research on Threshold and Regularity of Mixed Layer Thickness in Heavy Pollution Weather in Tianjin[J]. Meteorological Monthly, 44(7): 911-920. DOI: 10.7519/j.issn.1000-0526.2018.07.006. 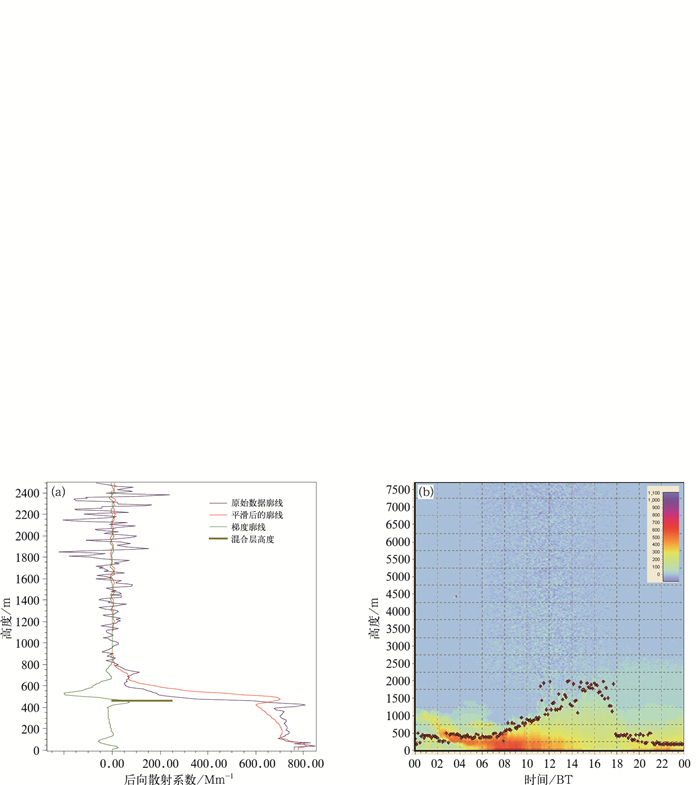 Abstract: Based on ceilometers inversion data and simulation data, the dataset of mixed layer thickness in Tianjin were constructed, the data of PM2.5 mass concentration and visibility in Tianjin during 2009-2015 were collected, and the threshold and regularity of mixed layer thickness in heavy pollution weather in Tianjin were researched in this paper. The results show that the thickness of mixed layer kept increasing during 2000-2015, having a strong consistency with the increase of nocturnal boundary layer height and the increase of inversion base observed by meteorological tower. Statistics show that PM2.5 mass concentration has exponential relationship with the thickness of mixed layer. The lower the mixed layer thickness, the higher the PM2.5 mass concentration. The thresholds of mixed layer thickness can be 200 m, 400 m, 600 m and 800 m, which can be used as limits to determine the vertical diffusion of atmospheric pollution. When the thickness of mixed layer is less than 200 m, probability of heavy pollution weather is 52%, and probability of moderate haze is 46%. 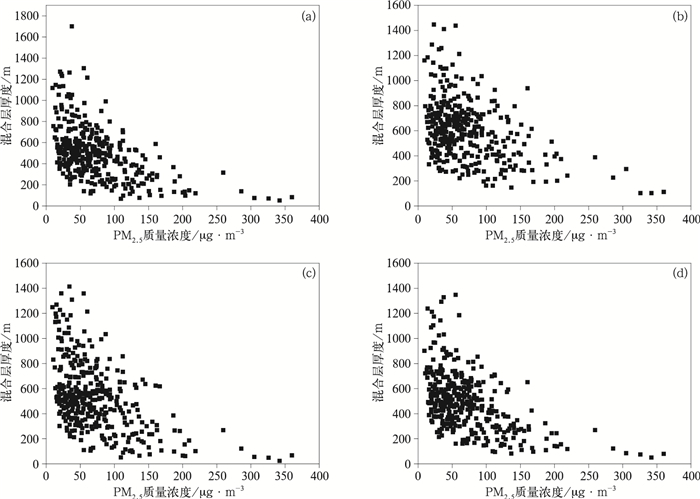 The negative correlation between PM2.5 average mass concentration and mixed layer thickness is not applicable to all pollution processes. For the transport of air pollution, the impact is from high altitude to ground surface. In the initial stage of pollution, the increase of mixed layer thickness is beneficial to pollutant transmission, causing the near-surface PM2.5 mass concentration to increase, which need to be considered carefully when the threshold of mixed layer thickness is used. 程一帆, 张兰慧, 尚可政, 等, 2011. 兰州市冬季霾的统计预报研究[J]. 中国沙漠, 31(3): 750-756. 邓涛, 邓雪娇, 吴兑, 等, 2012. 珠三角灰霾数值预报模式与业务运行评估[J]. 气象科技进展, 2(6): 38-44. 邓雪娇, 李菲, 吴兑, 等, 2011. 广州地区典型清洁与污染过程的大气湍流与物质交换特征[J]. 中国环境科学, 31(9): 1424-1430. 郭丽君, 郭学良, 方春刚, 等, 2015. 华北一次持续性重度雾霾天气的产生、演变与转化特征观测分析[J]. 中国科学:地球科学, 45(4): 427-443. 郝子龙, 蔡恒明, 王慧鹏, 等, 2014. 面向WRF/Chem模式MOSAIC气溶胶方案的资料同化实现[J]. 气象水文海洋仪器, 31(4): 1-6. 花丛, 张碧辉, 张恒德, 2015. 2013年1—2月华北雾、霾天气边界层特征对比分析[J]. 气象, 41(9): 1141-1151. 蒋伊蓉, 朱蓉, 朱克云, 等, 2015. 京津冀地区重污染天气过程的污染气象条件数值模拟研究[J]. 环境科学学报, 35(9): 2681-2692. 李梦, 唐贵谦, 黄俊, 等, 2015. 京津冀冬季大气混合层高度与大气污染的关系[J]. 环境科学, 36(6). 潘锦秀, 朱彬, 晏平仲, 等, 2016. 京津冀区域重污染天气过程数值预报评估新方法[J]. 环境科学学报, 36(8): 2752-2760. 汪靖, 张晓云, 蔡子颖, 等, 2015. 天津一次重污染天气过程气象成因及预报分析[J]. 环境科学与技术, 38(12): 77-82, 157. 王珊, 廖婷婷, 王莉莉, 等, 2015. 西安一次霾重污染过程大气环境特征及气象条件影响分析[J]. 环境科学学报, 35(11): 3452-3462. 王自发, 李杰, 王哲, 等, 2014. 2013年1月我国中东部强霾污染的数值模拟和防控对策[J]. 中国科学:地球科学, 44(1): 3-14. 薛文博, 付飞, 王金南, 等, 2014. 基于全国城市PM2.5达标约束的大气环境容量模拟[J]. 中国环境科学, 34(10): 2490-2496. 翟晓芳, 龙洋, 肖志峰, 2014. 武汉市灰霾天气特征分析及基于支持向量机的能见度预报[J]. 长江流域资源与环境, 23(12). 张人禾, 李强, 张若楠, 2014. 2013年1月中国东部持续性强雾霾天气产生的气象条件分析[J]. 中国科学:地球科学, 44(1): 27-36. 周春红, 2013. 大气气溶胶及其对云和降水影响的在线数值模拟研究[D]. 北京: 中国气象科学研究院: 1-30. 朱亚杰, 李琦, 侯俊雄, 等, 2016. 基于支持向量回归的PM2. 5浓度实时预报[J]. 测绘科学, 41(1): 12-17, 22.